Generate correlated systems of statistical equations which represent repeated measurements or clustered data. These systems contain either: a) continuous normal, non-normal, and mixture variables based on the techniques of Headrick and Beasley (2004) or b) continuous (normal, non-normal and mixture), ordinal, and count (regular or zero-inflated, Poisson and Negative Binomial) variables based on the hierarchical linear models (HLM) approach. Headrick and Beasley's method for continuous variables calculates the beta (slope) coefficients based on the target correlations between independent variables and between outcomes and independent variables. The package provides functions to calculate the expected correlations between outcomes, between outcomes and error terms, and between outcomes and independent variables, extending Headrick and Beasley's equations to include mixture variables. These theoretical values can be compared to the simulated correlations. The HLM approach requires specification of the beta coefficients, but permits group and subject-level independent variables, interactions among independent variables, and fixed and random effects, providing more flexibility in the system of equations. Both methods permit simulation of data sets that mimic real-world clinical or genetic data sets (i.e. plasmodes, as in Vaughan et al., 2009, <10.1016/j.csda.2008.02.032>). The techniques extend those found in the 'SimMultiCorrData' and 'SimCorrMix' packages. Standard normal variables with an imposed intermediate correlation matrix are transformed to generate the desired distributions. Continuous variables are simulated using either Fleishman's third-order () or Headrick's fifth-order () power method transformation (PMT). Simulation occurs at the component-level for continuous mixture distributions. These components are transformed into the desired mixture variables using random multinomial variables based on the mixing probabilities. The target correlation matrices are specified in terms of correlations with components of continuous mixture variables. Binary and ordinal variables are simulated by discretizing the normal variables at quantiles defined by the marginal distributions. Count variables are simulated using the inverse CDF method. There are two simulation pathways for the multi-variable type systems which differ by intermediate correlations involving count variables. Correlation Method 1 adapts Yahav and Shmueli's 2012 method and performs best with large count variable means and positive correlations or small means and negative correlations. Correlation Method 2 adapts Barbiero and Ferrari's 2015 modification of the 'GenOrd' package and performs best under the opposite scenarios. There are three methods available for correcting non-positive definite correlation matrices. The optional error loop may be used to improve the accuracy of the final correlation matrices. The package also provides function to check parameter inputs and summarize the simulated systems of equations. The goal of SimRepeat is to generate correlated systems of statistical equations which represent repeated measurements or clustered data. These systems contain either: a) continuous normal, non-normal, and mixture variables based on the techniques of Headrick and Beasley (Headrick and Beasley 2004) or b) continuous (normal, non-normal and mixture), ordinal, and count (regular or zero-inflated, Poisson and Negative Binomial) variables based on the hierarchical linear models (HLM) approach. Headrick and Beasley's method for continuous variables calculates the beta (slope) coefficients based on the target correlations between independent variables and between outcomes and independent variables. The package provides functions to calculate the expected correlations between outcomes, between outcomes and error terms, and between outcomes and independent variables, extending Headrick and Beasley's equations to include mixture variables. These theoretical values can be compared to the simulated correlations. The HLM approach requires specification of the beta coefficients, but permits group and subject-level independent variables, interactions among independent variables, and fixed and random effects, providing more flexibility in the system of equations. Both methods permit simulation of data sets that mimic real-world clinical or genetic data sets (i.e. plasmodes, as in Vaughan et al. (2009)). The techniques extend those found in the SimMultiCorrData (Fialkowski 2017) and SimCorrMix (Fialkowski 2018) packages. Standard normal variables with an imposed intermediate correlation matrix are transformed to generate the desired distributions. Continuous variables are simulated using either Fleishman's third-order (Fleishman 1978) or Headrick's fifth-order (Headrick 2002) power method transformation (PMT). Simulation occurs at the component-level for continuous mixture distributions. These components are transformed into the desired mixture variables using random multinomial variables based on the mixing probabilities. The target correlation matrices are specified in terms of correlations with components of continuous mixture variables. Binary and ordinal variables are simulated by discretizing the normal variables at quantiles defined by the marginal distributions. Count variables are simulated using the inverse CDF method. There are two simulation pathways for the multi-variable type systems which differ by intermediate correlations involving count variables. Correlation Method 1 adapts Yahav and Shmueli's 2012 method (Yahav and Shmueli 2012) and performs best with large count variable means and positive correlations or small means and negative correlations. Correlation Method 2 adapts Barbiero and Ferrari's 2015 modification of the GenOrd package (A. Barbiero and Ferrari 2015; Ferrari and Barbiero 2012; Barbiero and Ferrari 2015) and performs best under the opposite scenarios. There are three methods available for correcting non-positive definite correlation matrices. The optional error loop may be used to improve the accuracy of the final correlation matrices. The package also provides function to check parameter inputs and summarize the generated systems of equations. There are vignettes which accompany this package that may help the user understand the simulation and analysis methods. Theory and Equations for Correlated Systems of Continuous Variables describes the system of continuous variables generated with nonnormsys and derives the equations used in calc_betas, calc_corr_y, calc_corr_ye, and calc_corr_yx. Correlated Systems of Statistical Equations with Non-Mixture and Mixture Continuous Variables provides examples of using nonnormsys. The Hierarchical Linear Models Approach for a System of Correlated Equations with Multiple Variable Types describes the system of ordinal, continuous, and count variables generated with corrsys and corrsys2. Correlated Systems of Statistical Equations with Multiple Variable Types provides examples of using corrsys and corrsys2. Error terms have a Beta(4, 1.5) distribution with an AR(1, p = 0.4) correlation structure. These require a sixth cumulant correction of 0.03. There is an interaction between X_ord(1) and X_pois(1) for each Y. Since they are both group-level covariates, the interaction is also a group-level covariate that will interact with the subject-level covariates X_cont(1), X_mix(1) and X_nb(1). However, only X_ord(1) and X_pois(1) interact with time in this example. Normally their interaction would also interact with time. A description of this HLM model may be found in the package vignettes. This is the most time-consuming part of the simulation process. It is important to read the function documentation carefully to understand the formats for each parameter input. Incorrect formatting will lead to errors. Most of these can be prevented by using the checkpar function in Step 2. Note that use.nearPD = FALSE and adjgrad = FALSE so that negative eigen-values will be replaced with eigmin (default 0) instead of using the nearest positive-definite matrix (found with Bates and Maechler (2017)'s Matrix::nearPD function by Higham (2002)'s algorithm) or the adjusted gradient updating method via adj_grad (Yin and Zhang 2013; Zhang and Yin Year not provided; Maree 2012). #>  "TRUE" "TRUE" "TRUE" "TRUE"
#>   "cont_sum_y"   "rho.y"        "cont_sum_e"   "target_sum_e"
#>   "rho.e"        "rho.ye"       "ord_sum_x"    "cont_sum_x"
#>   "target_sum_x" "sum_xall"     "mix_sum_x"    "target_mix_x"
#>  "pois_sum_x"   "nb_sum_x"     "rho.x"        "rho.xall"
A linear model will be fit to the data using glm in order to see if the slope coefficients can be recovered (R Core Team 2017). First, the data is reshaped into long format using reshape2::melt (Wickham 2007). Note that since X_ord(1) and X_pois(1) are the same for each outcome, they will be used as factors (id.vars) and are only needed once. All of the slope coefficients are estimated well. Ordinal variable XO1, where Pr[XO1 = 0]=0.2, Pr[XO1 = 1]=0.35, and Pr[XO1 = 2]=0.45, is a group-level variable and is static across equations. 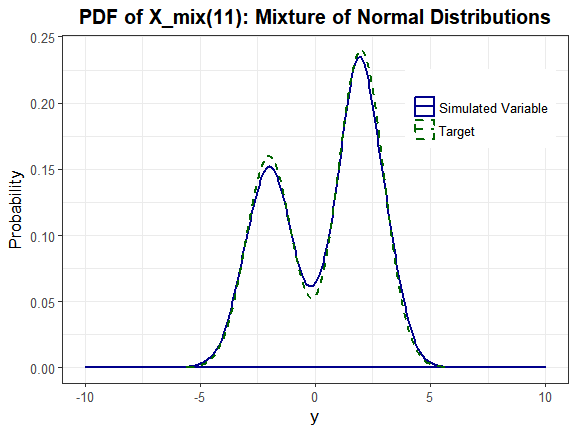 Continuous non-mixture variable XC1 is a subject-level variable with a Logistic(0, 1) distribution, which requires a sixth cumulant correction of 1.75. X terms are correlated at 0.1 within an equation and have an AR(1) structure across equations. The correlations for the static variable are held constant across equations. Random intercept U0 and time slope U1 with Normal(0, 1) distributions. Correlation between random effects is 0.3. The error terms have t(10) distributions (mean 0, variance 1) and an AR(1, 0.4) correlation structure. In this example, the random intercept and time slope have continuous non-mixture distributions for all Y. However, the functions corrsys and corrsys2 permit a combination of none, non-mixture, and mixture distributions across the Y (i.e., if rand.int = c("non_mix", "mix", "none") then the random intercept for Y_1 has a non-mixture, and the random intercept for Y_2 has a mixture distribution; there is no random intercept for Y_3). In addition, the distributions themselves can vary across outcomes. This is also true for random effects assigned to independent variables as specified in rand.var. #>   "target_sum_x" "sum_xall"     "rho.x"        "rho.xall"
#>  "rho.yx"       "rho.yxall"    "maxerr"       "target_sum_u"
#>  "cont_sum_u"   "sum_uall"     "rho.u"        "maxerr_u"
A linear mixed model will be fit to the data using lme from package nlme in order to see if the random effects are estimated according to the simulation parameters (Pinheiro et al. 2017). The data is again reshaped into long format using reshape2::melt. Each effect in the model was again found to be statistically significant at the α = 0.001 level. Barbiero, A, and P A Ferrari. 2015. 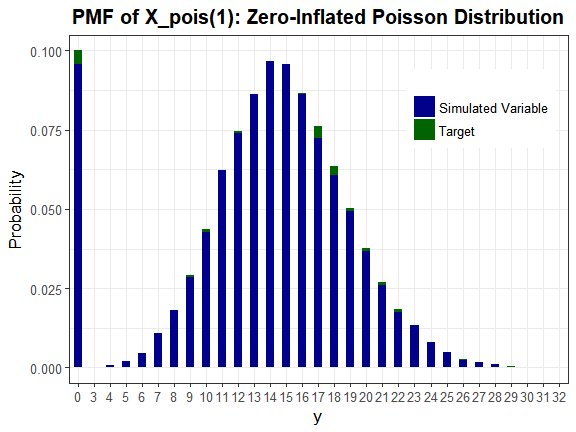 “Simulation of Correlated Poisson Variables.” Applied Stochastic Models in Business and Industry 31: 669–80. https://doi.org/10.1002/asmb.2072. Barbiero, Alessandro, and Pier Alda Ferrari. 2015. 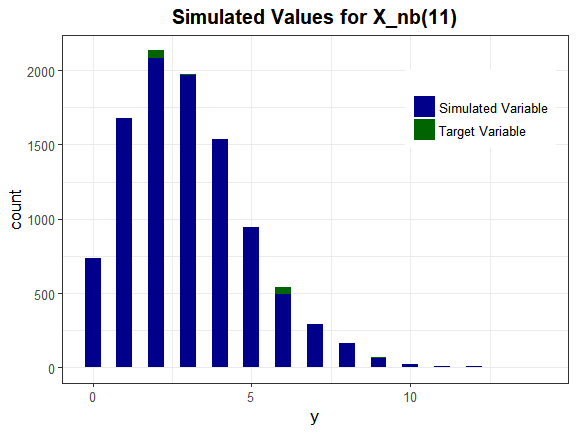 GenOrd: Simulation of Discrete Random Variables with Given Correlation Matrix and Marginal Distributions. https://CRAN.R-project.org/package=GenOrd. Ferrari, P A, and A Barbiero. 2012. “Simulating Ordinal Data.” Multivariate Behavioral Research 47 (4): 566–89. https://doi.org/10.1080/00273171.2012.692630. Fialkowski, A C. 2017. SimMultiCorrData: Simulation of Correlated Data with Multiple Variable Types. https://CRAN.R-project.org/package=SimMultiCorrData. ———. 2018. SimCorrMix: Simulation of Correlated Data with Multiple Variable Types Including Continuous and Count Mixture Distributions. https://CRAN.R-project.org/package=SimCorrMix. Fleishman, A I. 1978. “A Method for Simulating Non-Normal Distributions.” Psychometrika 43: 521–32. https://doi.org/10.1007/BF02293811. Headrick, T C. 2002. “Fast Fifth-Order Polynomial Transforms for Generating Univariate and Multivariate Non-Normal Distributions.” Computational Statistics and Data Analysis 40 (4): 685–711. https://doi.org/10.1016/S0167-9473(02)00072-5. Headrick, T C, and T M Beasley. 2004. “A Method for Simulating Correlated Non-Normal Systems of Statistical Equations.” Communications in Statistics - Simulation and Computation 33 (1): 19–33. http://dx.doi.org/10.1081/SAC-120028431. Higham, N. 2002. “Computing the Nearest Correlation Matrix - a Problem from Finance.” IMA Journal of Numerical Analysis 22 (3): 329–43. https://doi.org/10.1093/imanum/22.3.329. Maree, S. 2012. “Correcting Non Positive Definite Correlation Matrices.” BSc Thesis Applied Mathematics, Delft University of Technology. https://repository.tudelft.nl/islandora/object/uuid:2175c274-ab03-4fd5.../download. Pinheiro, Jose, Douglas Bates, Saikat DebRoy, Deepayan Sarkar, and R Core Team. 2017. nlme: Linear and Nonlinear Mixed Effects Models. https://CRAN.R-project.org/package=nlme. Vaughan, L K, J Divers, M Padilla, D T Redden, H K Tiwari, D Pomp, and D B Allison. 2009. “The Use of Plasmodes as a Supplement to Simulations: A Simple Example Evaluating Individual Admixture Estimation Methodologies.” Computational Statistics and Data Analysis 53 (5): 1755–66. https://doi.org/10.1016/j.csda.2008.02.032. Wickham, H. 2007. “Reshaping Data with the reshape Package.” Journal of Statistical Software 21 (12): 1–20. http://www.jstatsoft.org/v21/i12/. Yahav, I, and G Shmueli. 2012. “On Generating Multivariate Poisson Data in Management Science Applications.” Applied Stochastic Models in Business and Industry 28 (1): 91–102. https://doi.org/10.1002/asmb.901. Yin, JF, and Y Zhang. 2013. “Alternative Gradient Algorithms for Computing the Nearest Correlation Matrix.” Applied Mathematics and Computation 219 (14): 7591–9. https://doi.org/10.1016/j.amc.2013.01.045. Zhang, Y, and JF Yin. Year not provided. “Modified Alternative Gradients Algorithm for Computing the Nearest Correlation Matrix.” Internal paper. Shanghai: Tongji University.